An all-encompassing book with more than a thousand quotations, this work breathes life into an era unprecedented in world history. 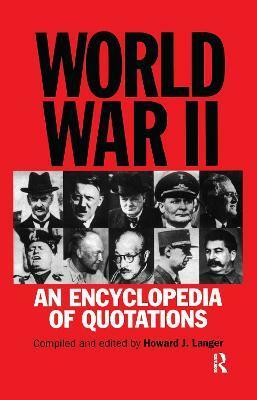 It looks at World War II in a new way with quotations from speeches, news accounts, memoirs, and interviews. Represented, too, are captured documents and material from Ultra and Magic, which broke the German and Japanese secret codes. All major political and military figures of the war are included, as well as many hitherto unknown. In addition, the encyclopedia serves as a lexicon of slang, nicknames and code names, and of war movies and war songs.